Here Squidoo is the easy and simple site to earn online. It can be the good money making machine for all the Nepalese because it is simple and you can use all the services provided by giant companies like Google Adsense, Amazon, Ebay and other sorts. To earn money you need to first make an account in Squidoo then you need to right some effective and attractive lens or it can be called as posts. Just make some interesting posts and if you do not have enough contents just try the content directories like articlecity and others. After you write a post you can monetize it with Adsense and sell the Ebay products there it is all free. If you really want to make good income in Squidoo you can try the lens with own originality and the best topic to write post can be lifestyle. You can try this method because it is simple and you can generate passive income too. Odesk is one of the best freelancing site which I recommend. In Odesk you can you can try versatile jobs it can be simple writing skill to complex high technical work. You can try any. Many Nepalese are still working in Odesk and having a good income. To work in Odesk you need to have good tie up with your client and serve them quickly and effectively as they want. Most effective category to work from Nepal in Odesk is Web designing and Wordpress. 99Designs is another kind of freelancing site that is especially launched for designers. If you have a bit of knowledge or if you are expert in graphics designing then this site is for you. Just make an account and join a competition where other designers will compete with you and the client who hosts the competition will choose the best design and they buy your design. Here the main part is never try to copy and be original. You can earn $99+ for a single logo due to this reason many teenagers and professionals are even attracted to it. So you can try this. Well the amount is small so there is no any complex job however you can sometime get offers by the client who is going to pay you more to do some complex job if you perform well so, in this way you can turn micro freelancing to real business. So try it. Well every webmaster know about Adsense, it is the best way to make passive income and believe me many webmasters are generating massive income from it. It is reliable and honestly one of the best. Since to get best you need to be best so to get approved by Adsense your content really matters. You need to have that what others do not have so it is a bit hard job. However form continuous labor and determination you can really score. Here Infolinks can be one of the best alternatives to Adsense. It is a kind of monetizing your website or blog. If you are really fade up with the approval process of Adsense then you can try this Infolink and really generate some passive income. So these were some important international sites that can be effective to make money online in Nepal. 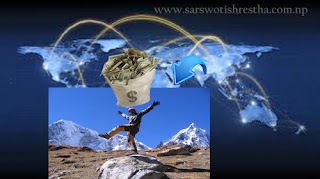 These sites are the best solution for the Nepalese seeking to generate some money online.